On gray days my thoughts turn to wine and chocolate. Here’s something for the chocolate half of that equation. • Preheat oven to 350 degrees F. Line a 9×13-inch baking pan with parchment paper, or grease with cooking spray. • Prepare brownie batter according to package instructions. • Pour about 1/3 of the brownie batter into the prepared baking pan. Spread until the bottom of the pan is evenly coated. Then add two even layers of pretzels, covering the entire surface. Carefully spoon the remaining brownie batter on top to cover the pretzels. • Bake for 30 minutes, or until a toothpick inserted in the middle of the brownies comes out clean. Remove and set on a cooling rack to cool. 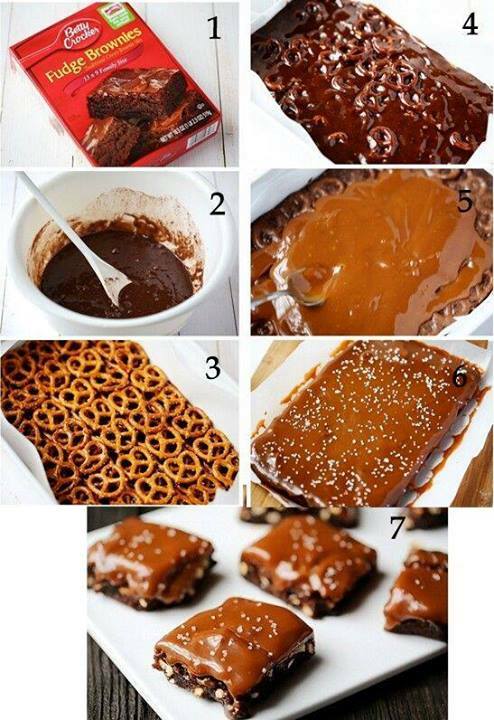 • Spoon the caramel sauce onto the top of the brownies in an even layer. (If it is too thick, spoon the sauce into a small bowl first and microwave for 30 seconds to thin.) Sprinkle the caramel with a few pinches of sea salt. • Serve warm, or let cool to room temperature then serve. Previous Every word is true … Next Happy 2014 to all my friends!